This October the InterContinental Miami is donning some serious Pink in honor of Breast Cancer Awareness month. From October 3rd through October 31st the entire façade of the iconic Downtown hotel will turn in to a unique pretty-in-pink tribute called “Canvas for the Cure” where the entire hotel will light up in bright pink LED lights. 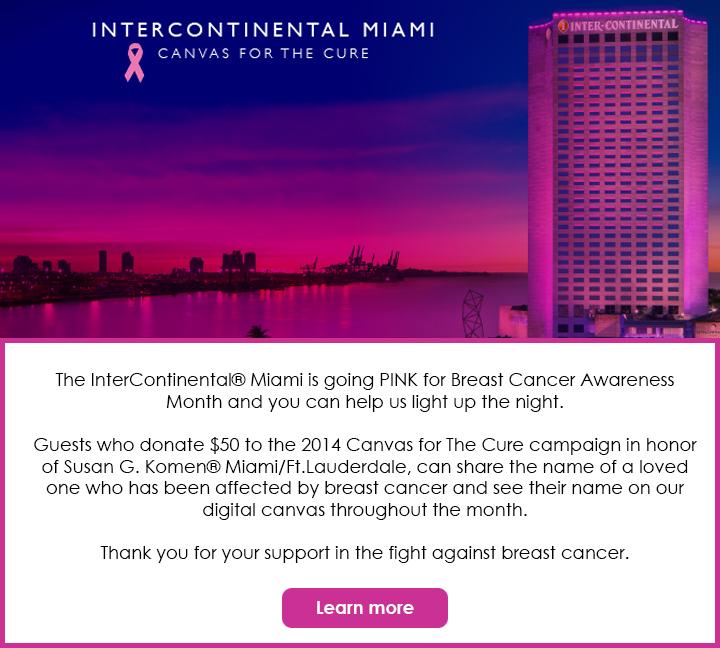 When the concept for the digital canvas was first developed in 2012, the InterContinental Miami knew they wanted to use it to bring the community together, whether through arts, culture or charitable campaigns. Over time it has evolved into an icon of the Downtown Miami skyline. Most notably known for the Miami Skyline Dancer silhouettes, the digital canvas is lit throughout the year to support various causes. The InterContinental Hotel teamed up with Susan G. Komen Miami/Fort Lauderdale to bring awareness and funds to the great organization. Supporters of the cause can make $50 donations in honor of a loved one, and in return, their loved one’s name will light up throughout the month of October on the hotel’s 19-story LED exterior canvas that can be seen from miles across Downtown and Biscayne Bay. The entire hotel is glamming out in PINK including the porte-cochere, the lobby and all concierge areas to show support for Breast Cancer Awareness. Those interested in supporting this campaign and seeing their loved ones names in lights can donate by clicking here. Since 1999, the Susan G. Komen Miami/Ft. Lauderdale Affiliate has raised more than $13 million to fund breast cancer screening, education and treatment initiatives. This one of a kind art installment that will not only increase awareness, but it will also be a beautiful addition shining across the city skyline. Miami get ready, THINK PINK and don’t forget #CanvasfortheCure!